Henry Roth (Adam Sandler) lives in Hawaii and spends his spare time bedding beautiful tourists, avoiding any commitment. Then he meets Lucy (Drew Barrymore) a beautiful woman who lives on the same island and has a brain condition that does not allow her to keep short-term memories. Each morning she wakes and the previous day has gone; she is back to the day before the car accident that causes her condition. Her father and brother spend their lives recreating this day for her. Immediately in love, Henry works on finding a different way for Lucy to live her life. I enjoyed this film in the most superficial way possible. Essentially, it’s a good, function romantic comedy. Don’t spend much time trying to analyse it. It’s not worth it, and it will fall apart quickly. Also, don’t spend too much time looking for the chemistry between Henry and Lucy – it’s almost non-existent. 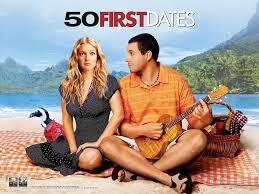 I’ve never really minded Adam Sandler, but watching this, I totally get why so many people can’t stand him. Especially with all of the stupid, quirky characters, and Rob Schneider. Oh, for crying out loud.